A couple of months ago we reviewed a few of the newest six-core Intel commercial CPUs that are also used in low-end servers. Intel has also launched some quad-core models, which we are focusing on today. These Xeon E quad-core processors compete directly against AMD's Ryzen Pro product line, focusing on manageability, ECC memory support, and guaranteed product longevity. When Intel moved away from its Xeon E5/E7 naming scheme for its server processors, there was a substantial outcry from IT procurement everywhere. By removing a system that was well known and replacing it with exotic metal names such as Xeon Platinum, Xeon Gold, Xeon Silver, and Xeon Bronze, everyone knew it would mean relearning Intel's product segmentation rules and also teaching it to the executives that would sign off on purchasing rules. The mainstream server market was not the only one to go through a name change - the popular workstation processor models were renamed Xeon W, and the last domino to fall was the Xeon E3-1200 processor line, now named Xeon Entry, or E for short. Mobile E3-1500M - - - - v5 v6 E-2100 ? Consumer E3-1200 'v1' v2 v3 v4 v5 v6 E-2100 E-2200? 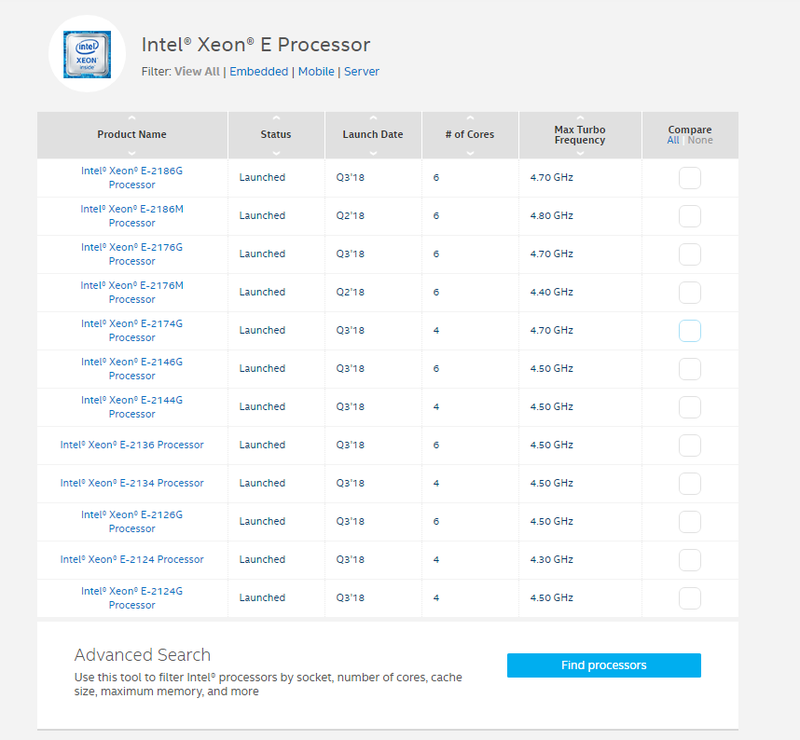 The latest launch, which would have been the Xeon E3-1200 v7, becomes the first generation of Xeon E-2100, bringing it in line with the workstation processors (Xeon W-2100) and the networking/compute crossover family (Xeon D-2100). 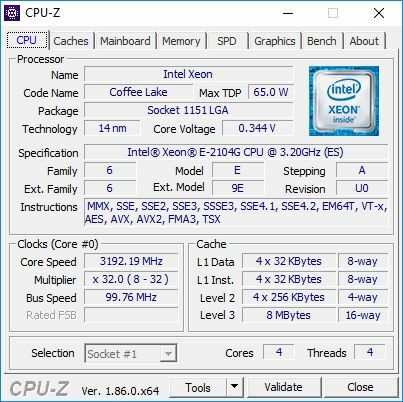 Intel launched 11 processors, a range of quad-core and six-core parts, using the Coffee Lake microarchitecture. In our previous review, we tackled the six core parts: the E-2186G, the E-2176G, the E-2146G and the E-2136 processors. This time around we are focusing on the quad-core parts we have tested - the E-2174G, the E-2134, and the E-2104G. For these processors, the final digit shows the core count, and the G indicates integrated graphics. 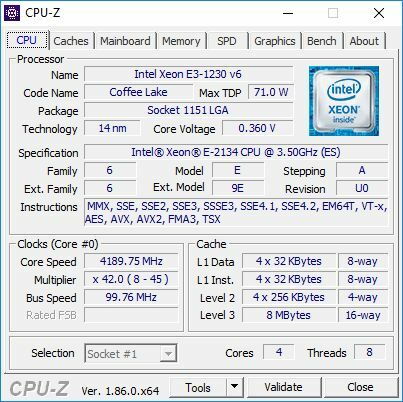 The Xeon E family are derivatives of the consumer processor line, but instead are locked to C236 chipset motherboards but support ECC memory. This means they primarily fit into the commercial market, where businesses will have prebuilt systems with error correcting memory for data safety. These processors also support vPro, enabling management features across a network, and both virtualization options (VT-x and VT-d) that enable the parts for virtualized networks. The Xeon E-2174G is the top quad-core processor of this line, with hyperthreading and with a 3.8 GHz base frequency and a 4.7 turbo frequency. As we discovered in our six core review, these processors and the motherboard manufacturers tend to stick to the strict Intel defaults when it comes to power management, unlike the consumer motherboard segment. This means we should expect it to perform similar to consumer processors in single-threaded tests, but in multithreaded expect it to max out at its all-core turbo frequency. At 71W for TDP, we would expect this to also be the sustained load power consumption too. The E-2134 is a lower clocked variant without graphics, however the E-2104G is far more interesting. This processor is an off roadmap part, meaning it isn't sold to retail or distributors, but to specific OEMs that wanted this configuration. In this case, it is a lower TDP quad-core processor (65W rather than 71W) with no turbo frequency - 3.2 GHz all the time when at load. It still has integrated graphics, but has the lowest turbo frequency at 1100 MHz. From Intel, if you still want a Xeon, then the Xeon Scalable line has some low frequency six core Bronze processors that are at $350. If you don't need ECC or manageability options, then Intel's consumer parts offer extra performance. From AMD, these Xeon Entry processors compete up against the Ryzen Pro family, which offers similar management options (through DASH), as well as ECC support (depending on the motherboard), long term stability, and a wider range of options from eight core to quad core. The Ryzen Pro parts are identical in specifications to their desktop counterparts. For anyone looking for the Ryzen Pro chips in retail packaging though, you're out of luck - AMD only sells these to OEMs. Unfortunately we haven't been sampled these parts either - we only have a solitary SKU I purchased from China with my own money.